"Regulatory systems must be science-based and timely. They also must be predictable. Right now, the only thing we can predict about GM crop approvals is that they'll take far too long. On our farm, we can't plan what to grow or when to rotate our crops. "The only way to restore trust in the EU system now is for the Commission to hit the pause button on GM crop approvals and to urgently reform safety testing and the approval system. 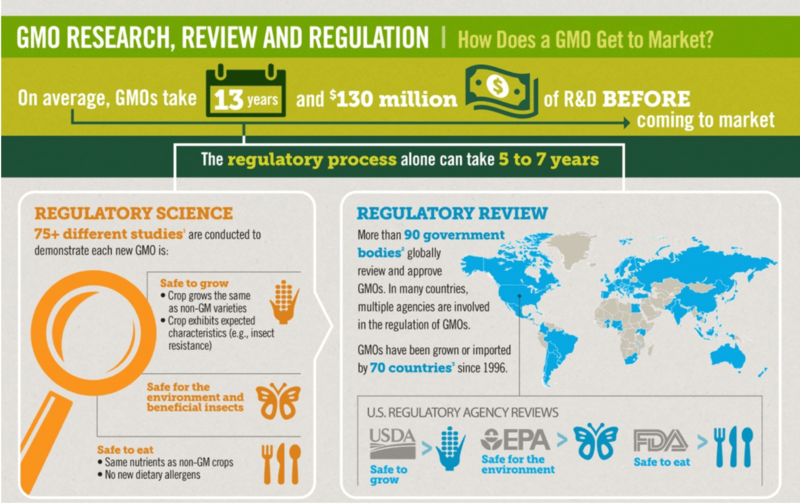 It is no small undertaking to successfully shepherd a new GMO product through the maze of regulatory and testing requirements encountered around the globe. In the United States, where much of the agricultural genetic engineering occurs, it takes an average of nearly eight years and the expenditure of more than $135 million to develop a new trait and move it through the regulatory process. Approval times are faster in the European Union, at less than five years. However, the time differences can be misleading, as most EU applications are not asking for approval to grow the new plants, since a majority of the member nations ban cultivation of GMO crops. Regulatory hurdles are even higher for genetically engineered animals. The only one approved to date in the U.S. is the fast-growing AquaAdvantage Salmon. Its creator applied for approval in 1995, but was not green-lighted until 2015, and it’s still years from passing technical hurdles before it can be marketed. Under the coordinated framework, regulation of genetically engineered crops and animals has been cobbled together under the jurisdiction of three different government agencies: The Department of Agriculture, with existing authority to regulate “plant pests,” approves all releases of GMOs to make sure that they don’t create an environmental hazard. The Environmental Protection Agency, with authority over pesticides, must approve all crops that contain insect-killing genes. And the Food and Drug Administration is responsible for evaluating whether GMOs are safe to eat. A new GMO product can fall under the jurisdiction of only one or as many as all three of the agencies, depending on what is being developed. A new crop that’s going to be used both for human food and animal feed, for example, might fall under jurisdiction of all three. GMO crops are treated much like any other food. If it turns out that they cause health problems, the FDA can order them taken off the market, but the FDA does not currently require biotech companies to submit these crops for approval before they go on the market. Although formal studies are not required, biotech companies developing a new GMO have waited for the FDA to issue a letter certifying that the agency has looked at the product and found no safety issues with it. The White House has now urged federal agencies to draw up new regulations to focus on “transparency,” “predictability” and a commitment to “reduce uncertainty in their regulatory processes.” The U.S. historically has taken a product-focused “risk based” approach based on weight of evidence. But competing agencies and campaigning pressure from anti-biotechnology groups has resulted in the adoption of more precautionary views in recent years. It’s not clear whether the U.S. will also embrace a European-style process-based approach going forward. The devolution of the oversight system over the past 30 years has dramatically slowed the adoption of new GM seeds and animal products. From 1988 to 1997, it took an average of 3.6 years to gain approval for a new GM product. (In addition to the half dozen or more years spent in research and development) But from 1998 to 2015, that wait time stretched to 6.8 years (13 years total including R&D) at an average cost of $130 million—according to research by economists at the management school at Queen’s University. While plants have a clear, if torturous, path to approval under the framework, GM animals must travel through regulatory no-man’s land. Animals are overseen by the FDA as drugs. The FDA has approved only two products—an anticoagulant derived from the milk of transgenic goats and the AquaBounty salmon, which grows twice as fast as a non GMO version. The salmon approval process took 20 years, a time frame that only multinational corporations with deep pockets can afford. (The entrepreneurial start up AquaBounty was taken over by Intrexon when it became clear it did not have the resources to press the regulatory process). Even after jumping regulatory hurdles, politics can intervene. Writing in the Genetic Literacy Project, Forbes and Slate (detailed in December 2012), the GLP’s Jon Entine exposed how White House politics blocked formal approval of the fish even after it was approved by the FDA. The GM salmon is still years away from making it to consumers’ plates. Things are even more complex in Europe, where anti-GMO sentiments have created a cumbersome landscape in which cultivation is widely banned even as those nations import significant amounts of GMO animal feed. As in the U.S., the approval process in the E.U. has both scientific and bureaucratic stages. But there also is a political stage. Even after the European Food Safety Authority signs off on a new crop, it still must be approved by a legislative body—the Standing Committee on the Food Chain—comprising representatives from each of the E.U. nations. The approval time is currently less than it is in the U.S., coming in at just under 5 years, according to the Queen’s University study, but that is because the GM products being evaluated are for import, not cultivation. Some of the information generated for approval in the E.U. relies on information generated for the approval process in the U.S. Further, applications in the U.S. almost always include field trials as applications include cultivation, while the majority of the applications for approval in the E.U. are for “import and processing” and not for “cultivation.” Thus, we avoid a statistical comparison of their total approval time as it would be theoretically flawed. The situation in Europe is just one example of another regulatory problem faced by biotech pioneers. Even after a new trait has been approved in the U.S., that doesn’t necessarily mean the seeds are ready to be marketed. Given the global nature of today’s grain markets, approvals must also be gained from nations who want to import the GM product, usually to be used as animal feed. Otherwise companies run the risk of finding themselves in the ugly situation encountered by Syngenta in 2013, when it sold a new corn seed that had not yet been approved in China. The corn, MIR 162, was approved in the U.S. in 2010. China, which is known to be slow with its GMO approvals, rejected thousands of tons of corn after testing revealed traces of Syngenta’s new seed. That, in turn, prompted lawsuits against Syngenta by corn growers, grain handlers and feed companies. Based on the results of the survey into the actual time associated with each activity stage of the R&D process, the overall time involved in regulatory testing and approval appears to have increased. If this trend is real and continues it could have a significant impact on the cost of regulatory testing and authorization in future years. 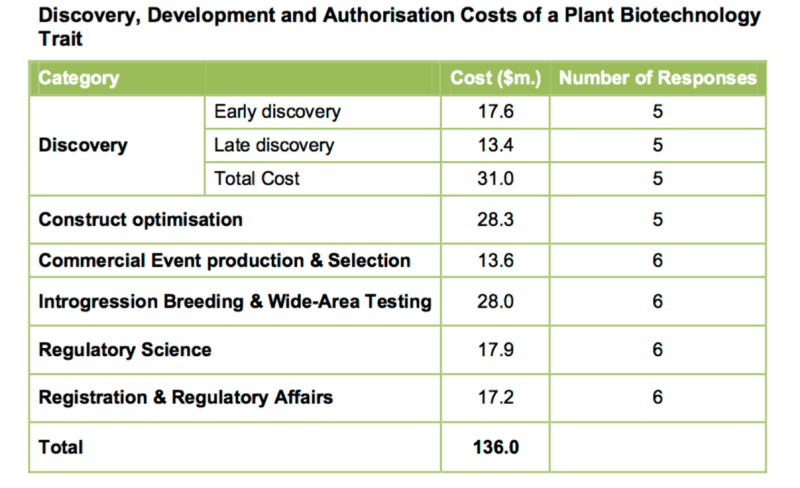 The high cost — both in terms of time and money — to bring a new GM trait to market is often cited as one of the limiting factors in developing plants and animals that could offer a wide range of benefits to the world. The fruit found a smooth path to commercialization. According to its inventor, plant pathologist Dennis Gonsalves, the papaya received its approvals from the FDA, EPA and USDA just two years after the start of the regulatory process — allowing a much faster recovery by the island state’s papaya industry. Researchers in the field of genetic engineering are hopeful that relief from high costs and unnecessary regulatory hurdles may be on the way. The federal government is looking at an overhaul of the way it regulates GM products. Anti-biotechnology activists are using this announced revision window to press for the introduction of process-based regulations and the formal implementation of the precautionary principle, which would extend the approval process even more. One of the biggest unknowns is how newer technologies—including RNA Interference and gene editing tools like CRISPR/Cas9—will be handled. These promising technologies allow researchers less-expensive options with more precise control and the ability to avoid the controversial practice of transgenics—in which genetic material from unrelated species is combined. 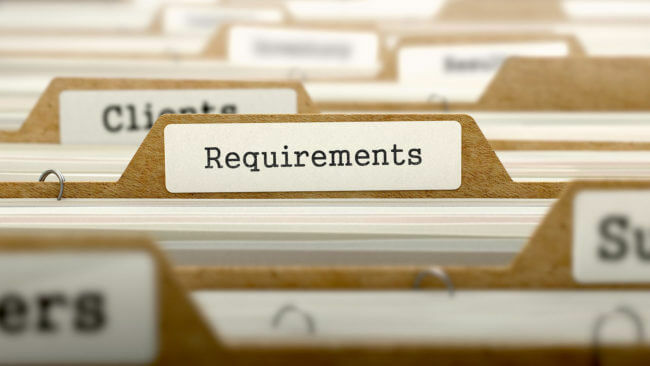 A number of new products, including including apples and mushrooms that don’t brown and a non-bruising potato have been approved, as they do not fall under the Coordinated Framework. Also in development are hornless cattle and pigs that don’t need to be castrated.